John Master's is most well known for their killer haircare range. It's certainly how I was introduced to the brand and it was quite awhile before I realised they also had a range of skincare! The range is fully established with several options for different skin issues and skin types, they use mostly all organic ingredients (70-100% of the formula), and also include no irritating preservatives such as phenoxyethanol (which I try to avoid). 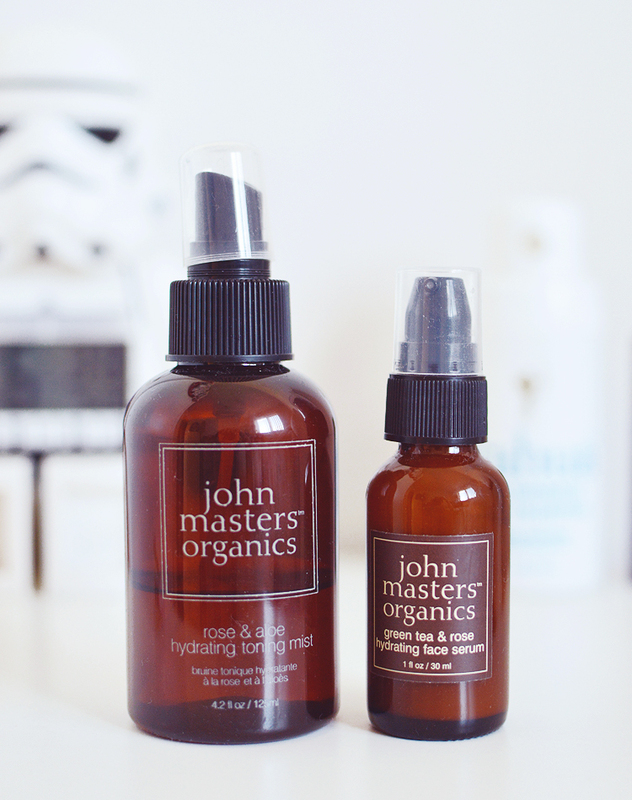 I had wanted to try some of their skincare for quite a while, and when looking for some good hydrating products for my dehydrated skin a few months ago I liked the look of these two rose based hydrating products. I've been using both serum and mist daily now in my routine since the very beginning of May and finally need to share the love! The Rose & Aloe Hydrating Toning Mist was a no-brainer purchase, I do love a good toner, and as I wasn't too impressed with the one I was using at the time I was relieved to find that this was everything I was hoping for. The ingredients list is simple with aloe, rose and glycerin being the main trio. All great for dry, dehydrated, stressed, tired, hormonal and spotty skin. Yes, it turns out it's possible to have that many things wrong with your face at once. The mist is great (always very important) it doesn't shoot water at your face and spreads a fine mist evenly so that I need only 2-4 spritz per use. Used day and night since the beginning of May I'm now on my last 1cm of toner in the bottle, so I feel like it was pretty good value too, as I do tend to use toner up faster than the speed of light. I was less sure about what I was getting into with the Green Tea & Rose Hydrating Face Serum as I didn't read any reviews and just went off of the description and ingredients list. It sounded like a great match for the toner and something my skin would benefit from. Luckily my gamble paid off and this fit into my routine perfectly and has also been used daily ever since. The serum is a very light cream texture that sinks into skin very easily, I've been using 1-2 pumps of this mixed with some moisturiser and two drops of cacay oil for my morning skincare routine. I much prefer mixing everything I want to use together and applying in one layer rather than layering up my skincare. It seems to overwhelm my skin less and helps the oil sink in too, making the perfect base for my foundation that doesn't develop into dry patches as the day goes on. I wouldn't say this serum is the be all and end all of serums, I've used better, but I've also used worse! For £25 it's an absolute gem and totally helped my skin rebalance itself over the past couple of months. I've used about half of the bottle now and will continue to use it as a hydrating little boost for my face.